From time immemorial, culture, education, and training have been assigned an essential role in preserving and developing common values that tie the international community together. Distinguished documents of international conferences and in various treaty texts and protocols show how cultural policy is the pre-eminent driving force for improvement of the intangible quality of individual and social life. Culture and education make an immeasurable contribution to the integration of a person in society and to the European society as such. Also from time immemorial, the principles of freedom and equality find their application in cultural and educational policy. Both support the rights to social multiformity and to protection of minorities; both also remind us that certain human values transgress every `local' culture. 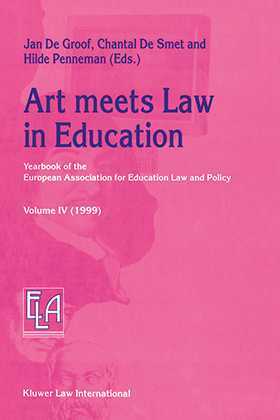 This volume considers in detail not only the recent trends in the organisation and structure of Art Education, but also the interplay between the two within standard education, the application of the principle of freedom of movement and Mobility of Teachers and Students, the equivalence of diplomas, and so forth.